Sunsets from your patio. 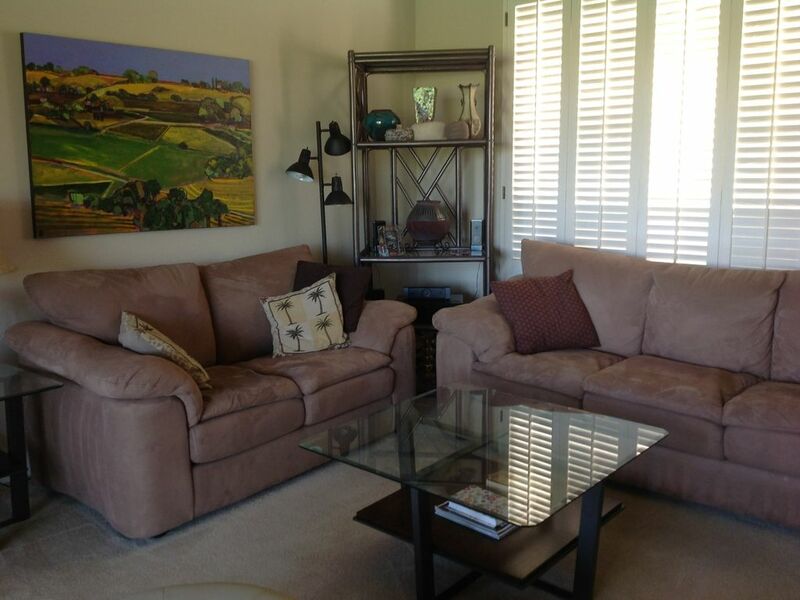 This three bedroom, two bath Monterey Country Club Condo offers everything you'll need to make your stay relaxing and fun. It's your home-away-from-home. Plantation Shutters, utilized throughout, can be open to expose the beauty of the golf course or closed for quite reflecting. The master bedroom has a king-sized bed and private bath, with walk-in handicap shower. The second and third bedroom each have queen beds for your comfort. All rooms have their own TV. The baths are fully equipped with towels and supplies The beautiful dining room sits 6 comfortably. All linens are provided, including pool towels. The condo is freshly painted and remodeled. New kitchen cabinets, tile floors and s/s appliances. The patio is equipped with a gas BBQ, patio furniture and views of the near by mountains and of course the golf course. We are on the 3rd tee and across the course from the pool and jacuzzi. Come enjoy the art work of nationally known and museum collected artist Mark Bowles.